This is one of the most common types of collisions or accidents involving Virginia cyclists. The accident occurs when the cyclist goes through an intersection at the same that a car that pulls out from another street, driveway, or parking lot, to right of the cyclist. The car driver does not look closely and pulls out. 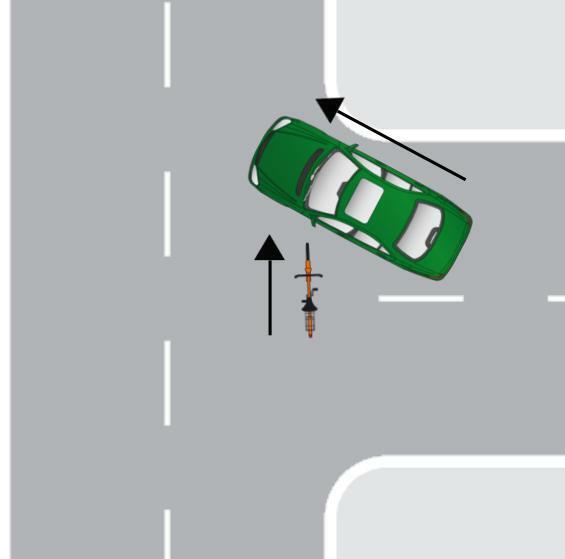 The cyclist is either hit on the right side by the front of the car or the cyclist hits the driver's side of the car. Slow down. Be alert when you reach an intersection for other vehicles. If you see that a car is coming from the other street or parking lot, slow down enough so that you can stop in time if the car pulls out in front of you. While you do have the right-of-way, it is much better to avoid the accident altogether than suffer the injuries that result from this type of collision. Make sure you are visible. Whether it's day or night, you should wear clothes or use gear that make you more visible - although it is especially important at night. For example, wear bright clothes and use a light on your bike. Ride more toward the center of the lane. While you should normally ride to the right as you approach intersections or driveways, if you move more to the center it makes it easier for the driver of the car to see you and lessens the likelihood of you being injured. Make noise. If you have a horn or bell use it. If it is obvious the driver doesn't see you yell out to get his attention. Again, you have the right-of-way but do what it takes to be unharmed. Most likely, liability (fault) will be placed on the driver that pulled out in front of the cyclist, provided that the cyclist had the right-of-way assuming the car had a stop sign or for other reasons had to yield to the traffic in the direction the cyclist was traveling. BUT, you have to understand Virginia is a contributory negligence state. This means that if you as the cyclist are negligent in some way (e.g. going too fast, not riding at night with a light) then you cannot recover for you injuries.